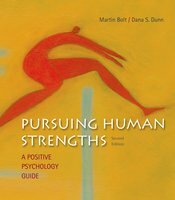 Pursuing Human Strengths gives instructors and students the information and strategies they need to understand the field of positive psychology and to put what researchers in the field have learn to effective use in their own lives. The new edition welcomes coauthor Dana Dunn, who shares Martin Bolt's passion for exploring and teaching positive psychology. Their engagingly written update includes over 175 new references, reflecting the continuing expansion of the scientific literature in positive psychology, as well as updated exercises and activities throughout. Pursuing Human Strengths can serve as a core text for courses in positive psychology and well being and can also serve as a great accompaniment to virtually any psychology course (most notably, human adjustment and growth, introductory psychology, and abnormal psychology.